As we normally do on weekday mornings, we were scrolling through luxury e-commerce favorite Net-a-Porter sipping our coffee when we realized not only does the site have a pretty cool selection of on-trend items (no surprise there), but it weirdly also has so many good turtleneck sweaters right now. And we happen to be in the market for the coziest knits to keep us chic and bundled through the winter. So below, we’re sharing with you our favorite pieces among the treasure trove of turtlenecks on the site. 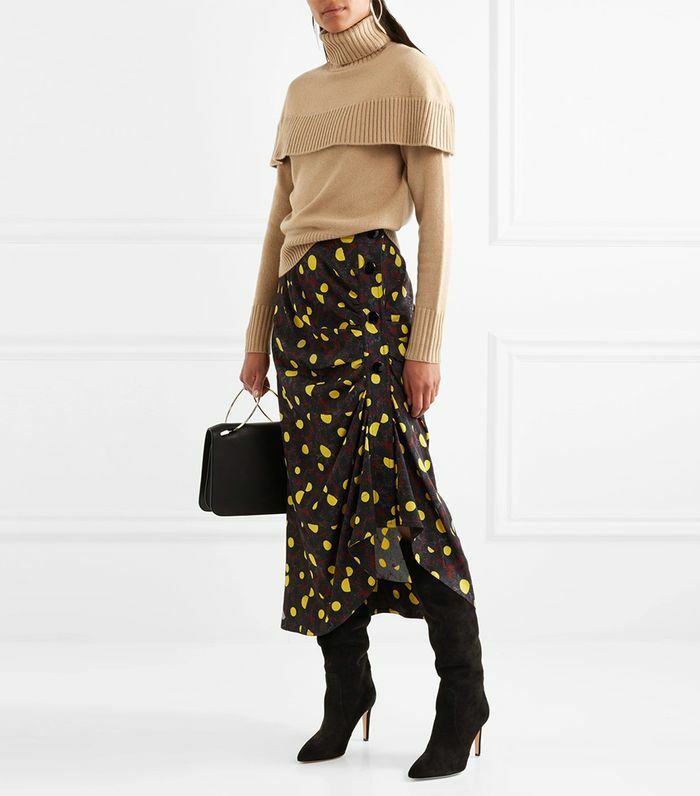 From chunky, cropped knits we’re planning on wearing with our high-waisted pants to the thin ribbed versions that are begging to be layered, Net-a-Porter is the only place we’ll be shopping for the high-neck knit this winter. And in case you somehow missed the memo, they’re having a massive sitewide sale on so many pieces. Go on to shop the most stylish turtlenecks from Net-a-Porter’s selection. Best when worn half tucked into a printed midi skirt. Incredibly cool with vinyl pants. Who said turtlenecks couldn't be night-out pieces? They obviously never saw this cool Tibi piece. Get ahead on the hue that's shaping up to be spring's best. We've never seen pearl embellishments quite like this before. If you're looking for a chunky cropped knit to complement high-waist pants, this is the sweater for you. This simple piece makes for the ideal day-off outfit with relaxed-fit jeans. Pair with loose tailoring in burnt shades. Fashion girl's all know that camel is the most expensive-looking color. This sweater's easygoing swing shape looks especially good with wide-leg trousers. If we were utterly obsessed with true reds this fall, it's rich shades of burgundy that we have our eyes on for winter. This turtleneck is all about the eclectic sleeves. A lesson in how to color-block correctly. We love the artful cutouts on this turtleneck. While they may not make for the warmest sweater you'll own, they certainly make the case for a cool nighttime option. Wear with simple silver jewelry to pick up the ring detail. Mock necks are perfect for when you're not fully committed to a turtleneck but want a super-flattering option nonetheless. Balance this bright sweater with neutral tones.